RestoreIT is a straightforward application that lets you create a virtual image of your Windows installation so you can easily restore it should the operating system experience errors or become infected with malware. From the intuitive interface you can quickly create a system restore point once you give it a relevant name. You can create multiple restore points and they will all be marked in a calendar where you can view additional details for the selected item regarding their creation time. 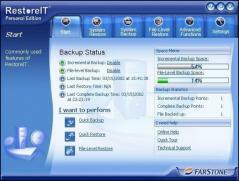 Reverting to a previously saved system backup takes very little time and it can be extremely useful in case of malware infections.